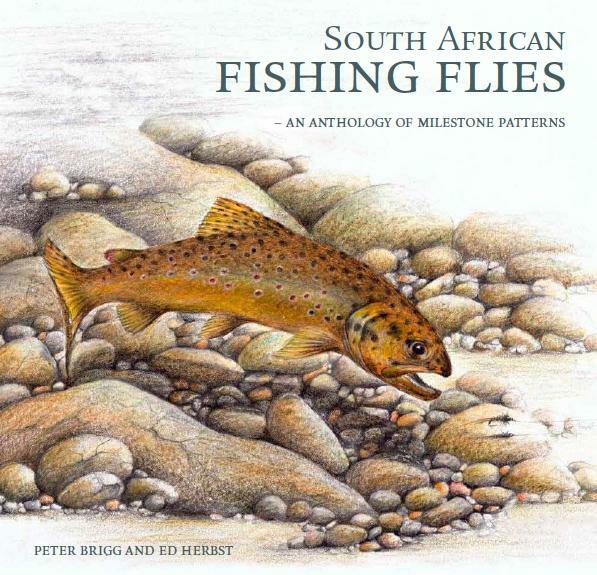 'South African Fishing Flies – An Anthology of Milestone Patterns' by Peter Brigg and Ed Herbst. FOSAF NEWS - 'South African Fishing Flies – An Anthology of Milestone Patterns' by Peter Brigg and Ed Herbst. Peter Brigg writes: More than four years of work by Ed Herbst and I on a joint book project will be rewarded when South African Fishing Flies – An Anthology of Milestone Patterns goes on sale. It traces, in some 25 chapters the South African fly tying journey, highlighting the contributions of leading fly fishers from Fred Bowker in the early 1920s with his Mountain Swallow, through the 1960s when Mark MacKereth was introducing on Cape streams, the flies and tactics which had proved successful on the small streams of his native Yorkshire to the pioneering work done by Leonard Flemming in catching mullet on the dry fly. The book follows the full colour design and layout of my earlier book, Call of the Stream albeit in a square format. We will also be producing 52 signed and numbered limited editions. They will be bound in full gazelle leather with silver foiling on the spine and a separate slip case. More than half have already been reserved. Anyone requiring further information or interested in reserving a copy, can do so by contacting me on email at pbrigg@iafrica.com." Priced at about R300,00 it should be at your local fly fishing shop or Exclusive Books Branch within a day or so.